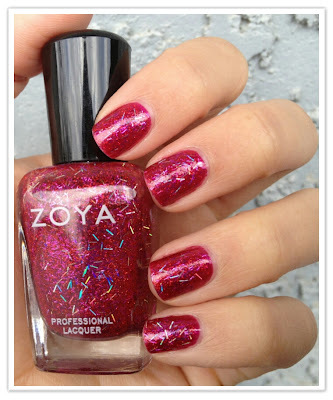 What I Blog About When I Blog About Books: NOTD: OPI "The One That Got Away" + Zoya "Kissy"
Today's notd is very much inspired by the fast-approaching new year. It combines a beautiful shimmery magenta, OPI "The One That Got Away" (Katy Perry Collection) with a fun Zoya glitter, "Kissy" (Gem & Jewels Holiday Collection). 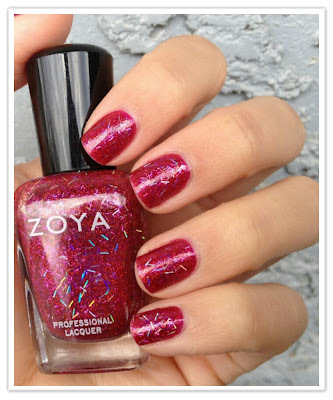 Zoya's "Kissy" is one of the first Zoya polishes I ever purchased and is the focus of this manicure. The base color of this polish is rather sheer and takes about 3 coats for opacity. 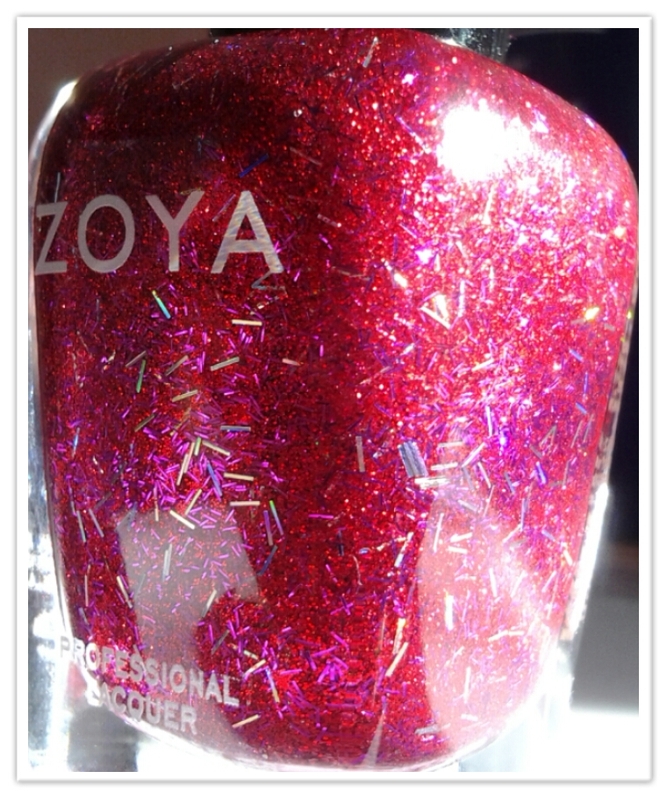 So rather than layer 3 coats of glitter, I decided to use OPI's "The One That Got Away" as a base. "Kissy" is a unique glitter featuring multicolored bar glitters (which were surprisingly easy to apply) as well as red/magenta finer glitters. 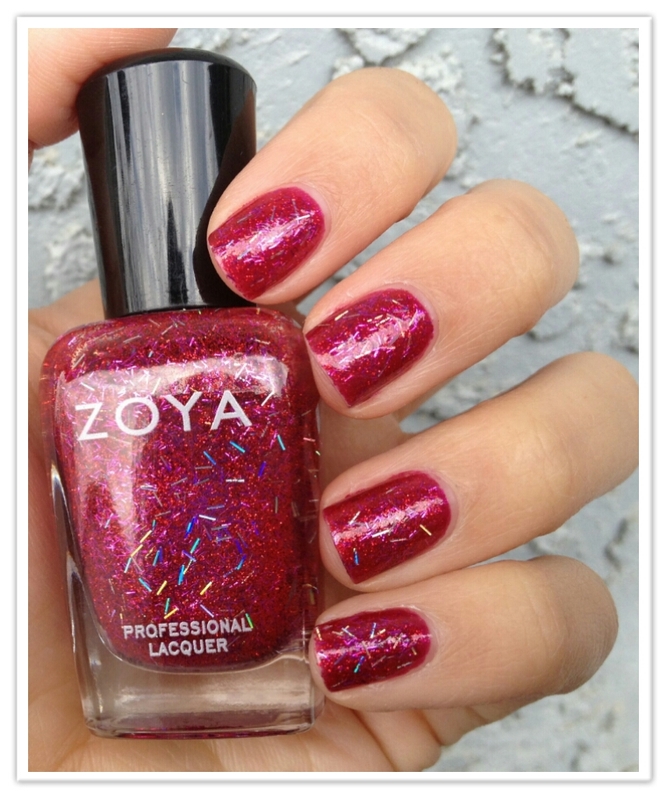 Despite its place in a holiday collection, I think it's a perfect polish for varying celebrations. I have found OPI's "The One That Got Away" to be the perfect base for this polish, though I'm sure many magenta/berry/red polishes could easily substitute. 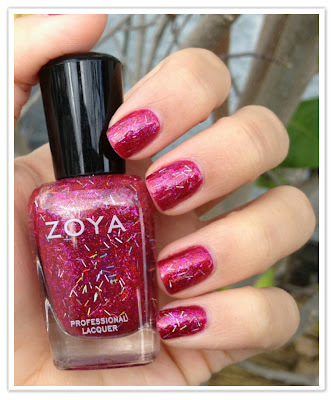 What I love most about this manicure is that it isn't too over the top. The bar glitters are fun to stare at, but they don't draw too much attention to my fingers. I definitely recommend enlarging the photos. I think Kissy is the only bar polish I'd attempt to wear. I like how it looks with 1 coat. Too many bars make me feel dizzy, weird no?